FRIDAY 17TH MAY EVENING SESSION / 18:00-22:30 . Please be aware that a maximum of two free child tickets can be booked per adult attending. Please note, there is no access for under 18s in the VIP area. YOU MUST HAVE AN ENTRY TICKET TO THE FESTIVAL IN ORDER TO PURCHASE A GIN TASTING CRUISE. PLEASE LOG IN TO THE 'ALREADY ORDERED TICKETS' SECTION ABOVE TO PURCHASE TICKETS. 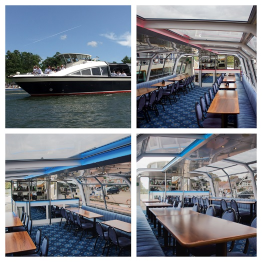 Step aboard The Hibernia- Hobbs of Henley's stylish Passenger Vessel for a voyage of Gin Discovery! You will have an opportunity to try a sample of three different gins on arrival and be given an introduction to each one by the team members behind these great Gins. Following a tasting, make your choice at the bar and receive a 35 ml Gin and Fevertree Tonic, with appropriate garnish, and enjoy the tranquil waters of the famous Marlow Reach, passing Bisham Abbey along the way. The Rivertrip lasts 30 mins and a cash bar will be available for other drinks.Unfortunately no glasses can be taken off at the end of the trip. Please be advised that the Cruise is for over 18's only. Childern will not be allowed onto the boat. * The transaction fee is £2.45 for E-ticket (Print-at-home) or £3.45 for Standard Delivery.